Have you ever seen the body builders at the gym shaking their blender bottles filled with protein shakes? Protein powder is all the rage these days for muscle building and getting lean, but as a Registered Dietitian Nutritionist, I’m here to give you the low-down on protein powders. Despite what marketing may tell you, protein powers may not be necessary for everyone. We created a guide to help you determine if protein powder is right for you (and which is the best protein powder to choose if you need it). Protein is one of three main nutrients we get in the foods we eat. Carbohydrates and fat are the other two main nutrients. Each main nutrient has specific roles on our body. Carbohydrates provide energy for work and play. Fats offer concentrated calories and help with absorption of fat-soluble vitamins. Protein is for muscle building and repairing tissues. The problem most people face is that they think more protein is better for more muscle building. They’ll pack in the high protein foods like meats, eggs, dairy, protein shakes, protein bars, and anything else that says “high protein” on the label. Here’s the thing: Whatever protein our bodies don’t use for muscle building and repair gets used up as energy or worse: stored as fat on our bodies! What’s the point in over-consuming protein if our body won’t use it like you want it to do? While protein is an essential component of our diet, we have to consume enough carbohydrates and fat so that our body doesn’t pull on the protein we eat for muscle building. So what’s the right amount of carbohydrates, fat, and protein? How do you know if protein powders are right for you? According to the Dietary Guidelines for Americans, most adults should consume 45-65% of their calories from carbohydrates and 20-35% from fat. Protein should only make up 10-35%. It is import that these recommendations are achieved; otherwise you may be using protein for energy and not for muscle repair. For more information about how carbohydrates, fats, and proteins all work together for proper muscle building, click here. Talk to a local Registered Dietitian (RD) to find out if you are meeting your specific protein needs. 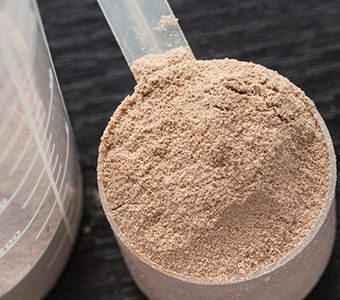 If you are still interested in incorporating protein powder into your diet, we’ve got the short list for you to help you navigate the complex protein powder market. In this article, you will learn about the best protein powder to add to your current diet and exercise regimen. You will also learn how to choose the best protein powder for your needs. We included great-tasting recipes that use a combination of ingredients and the best protein powder for building muscle! What Types of Protein Powder are Out There? Amongst the thousands of protein powders out there, there are several categories to choose from: dairy-based, plant-based, whey protein, organics (and even more). It is important that you think about which type of protein powder aligns with your diet and your taste buds. What are the best protein powders for men? Are there different products that are the best protein powders for women? What about for age? Here is the Registered Dietitian’s list of the best protein powders and our guide on how to choose the best protein powder for you. Be sure to check out our “Protein Powder Recipe and Tips” section below for recipe ideas and other tipson how to incorporate protein powder seamlessly into the diet. This whey protein powder beat out the others for its nutrition components. It is lower in calories, sugar, total fat, saturated fat, and sodium than comparable brands. If you’re not impressed by all the nutritional advantages of this product, you may take comfort in this whey protein powder’s 4.5 star review! Swanson Health was established in 1969 in Fargo, North Dakota. A man named August Swanson, an immigrant to the United States, suffered from joint pain and wanted to find alternative ways to relieve his pain. 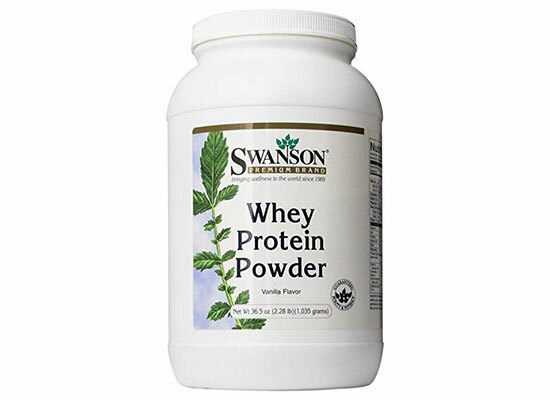 Today, Swanson Health makes several different protein powders like cow-based whey, goat-based whey, and pea protein. They offer gluten-free, kosher, organic, non-GMO, and cruelty-free products. If you want to add some flavor and protein to your breakfast shake, this is a great choice for you since this whey protein powder is lower in calories, fat, and sugars than other brands. This is also a good choice for someone who is trying to lose weight since it only adds 90 calories per scoop. This pea protein powder is both Registered Dietitian-approved and ranks as an “Amazon’s Choice” product for being highly rated by customers. This product received 4 out of 5 stars with over 2700 customer reviews. This protein powder packs a punch with protein while still keeping the fat, sodium, and sugars in check. NOW Foods was established in 1968, making 2018 their 50thanniversary. This brand has won countless awards. NOW Foods has won “Best Places to Work in Chicago,” “Clean Choice Awards,” and “Body Care Award Winner” in 2018 alone. NOW Foods specializes in products like supplements, essential oils, and even dips into the beauty and pet care realm. Aside from producing and their achievements, NOW Foods also takes pride in their charitable donations to Hurricane Harvey relief funds and other natural disasters. This protein powder would be great as a meal replacement shake for those days when you don’t have time to eat. This is also great for athletes who are in a time-crunch and won’t be able to consume a meal within an hour post-workout. NOW’s pea protein powder is safe for people with dairy or soy allergies, but always check the label on how these products are manufactured. Since this is a plant-based protein powder, vegans and vegetarians should consider using this powder. 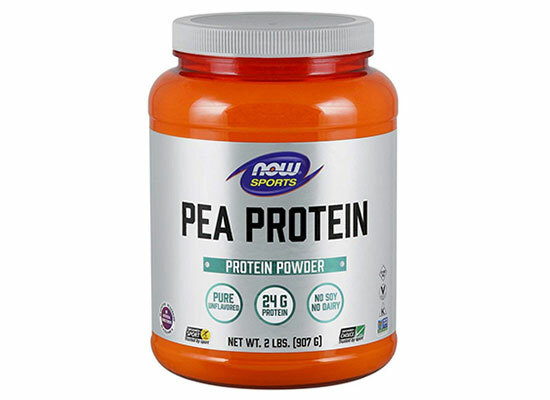 Here’s another great thing about this pea protein powder: since it is unflavored, this powder can be added to water, milk, juice, or any other drink, making this a highly-versatile product. As mentioned above, vegans may need extra help getting enough protein in each day. 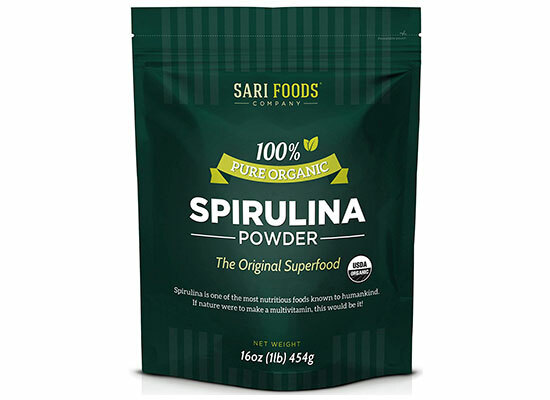 This spirulina powder is great for adding into a variety of foods like smoothies, smoothie bowls, frozen treats, pesto, and baked goods. This is a lower-calorie vegan option that is also fortified with vitamins and minerals that vegans may be lacking like iron and B12. Sari Foods is a young company that was founded in 2012. Their products come from plant-based food sources that are rich in antioxidants, essential fats, and micronutrients. This company strives to use “simplicity as the pathway to health and longevity.” Try out their other powders like Sari’s turmeric powder, fiber powder, and beet powder. Keep in mind that 1 serving of this product is smaller than the servings of other protein powders on this list. This smaller serving size makes it easier to add seamlessly into everyday recipes. If you are a vegan who struggles to get enough protein in during the day, this vegan protein powder with added vitamins and minerals would be a great option to include daily. For more options in vegan protein products, check out this in-depth article dedicated to analyzing vegan protein powders specifically. Orgain’s beginnings came from the personal struggle of its founder, Andrew, who suffered from aggressive cancer during adolescence. Many cancer patients like Andrew struggle to keep a healthy weight before, during, and after treatment. Doctors and Registered Dietitians typically encourage high calorie, high protein foods for cancer patients to maintain a healthy weight. In Andrew’s case, however, he wanted to create plant-based, organic, and nourishing food. Andrew’s story continued when he became a doctor and wanted to help patients like him overcome their illnesses. His efforts moved past the hospital where he was working when he created Orgain for the general public. 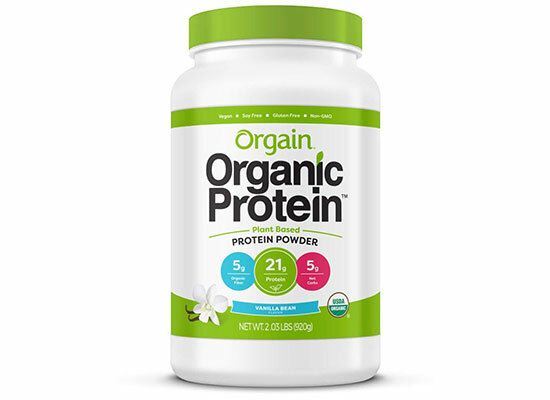 Orgain specializes in protein powder, protein bars, and ready-to-drink protein shakes for adults and kids. Aside from being organic and free of several of the top allergens, this product is also vegan. This is a well-rounded protein powder suited for virtually anyone who wants to add protein powder into his or her diet. One thing to keep in mind: This protein powder is a higher-calorie product compared to the other powders on this list. If you’re trying to lose weight, use this protein powder occasionally as a meal replacement for a full meal. Some protein powders can have tons of sugar and calories in order to make them taste good. This low carb protein powder differs from the rest of the products on this list for its refreshing berry flavor. Add this protein powder to ice water for a refreshing, juice-like beverage. You’ll be surprised that this power has 20 grams of protein per serving! Isopure was established 30 years ago by two men named Hal and Ernie. They wanted to make nutritional products for active people. 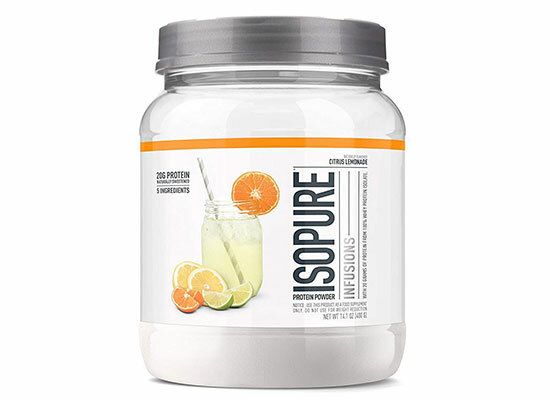 It was their dream to create nutritional products that were the “cleanest, purest, and most perfect protein around.” Isopure sells both ready-to-drink beverages as well as protein powders. Aside from nutrition products, they also sell a variety of active gear like shirts, jackets, and backpacks. If you’re sick of the milky texture and taste of most protein powders, add some variety with this low carb protein powder. Ditch the conventional chocolate, vanilla, and strawberry and try out all the refreshing fruity flavors Isopure has to offer. This would be great for the warm summer months. Experiment by mixing this powder with several beverages like sparkling water, unsweetened tea, and 100% fruit juice. One thing to note: This product does contain milk products (whey protein), so those with a milk allergy should not consume this powder. While there are several other protein powders on this list that are derived from plant-based sources, soy protein is a complete protein source, making it similar to animal proteins in eggs, meats, and cow’s milk. With the exception of soy protein, plants do not offer a complete protein profile and must be combined with other plant sources to get all essential amino acids. 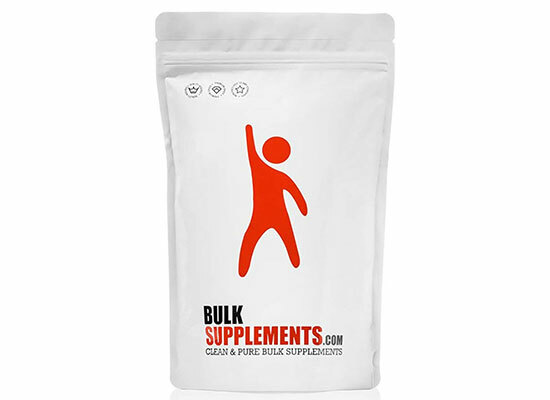 BulkSupplements is a nutritional supplement company based out of Henderson, Nevada. They are a hub for various nutritional supplements that support digestion, joint health, beauty, muscle growth, weight loss, and heart health. They also sell herbal supplements, vitamins, minerals, and weight scales similar to an online drug store. This plant protein powder gives you lots of protein in one little scoop since soy protein is a complete protein source. The only downside to this product is that is quite expensive per serving and contains only 3 servings per container. This soy protein powder would be great for someone who has increased protein needs from chronic diseases like malnutrition or cancer since it offers lots of protein per serving. Senior citizens who are at risk of muscle wasting may also benefit from this product to help maintain current muscle mass. Allergens and Hidden Contaminants: While this may be a given, a reminder to avoid your allergens is never a bad thing. It is essential that you read the ingredients label on all protein powders before you consume them. Aside from what goes into the protein powder, some powders are manufactured in the same facilities where cross-contamination of allergens may occur. This information can usually be found right on the protein powder label near the ingredients list. One quick note for people who are lactose intolerant: Despite the fact that whey protein comes from animal milk, whey protein typically contains zero to minimal lactose. Talk to a Registered Dietitian if you are concerned about lactose in protein powders. Plant-Based Protein vs. Animal-Based Protein: Understanding where the protein in your protein powder comes from may be important to you. If you are vegan, stick with plant-based protein like pea, spirulina, and soy protein. If you are vegetarian, you may feel comfortable consuming either plant-based or whey protein. If you eat a lot of animal products, try out the plant-based protein to add variety in your diet. 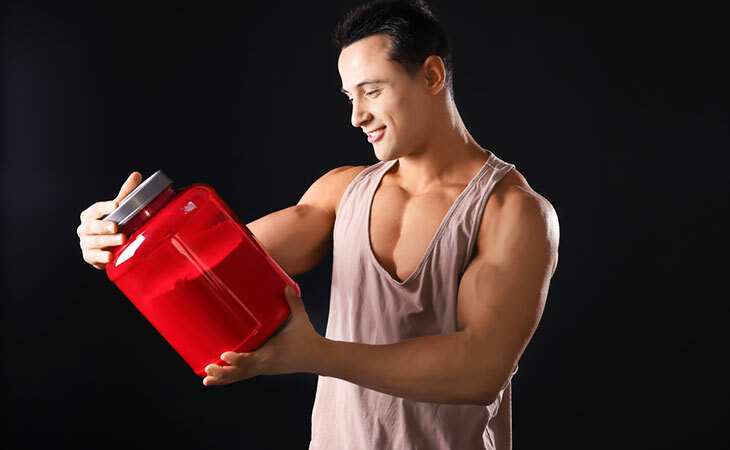 Your Nutrient Needs: Remember that protein powder is not essential to building muscle. Protein powders are items that should be used to supplement a healthy diet, not replace a healthy diet. For people who are trying to lose weight, protein powders can add excess calories if not coupled with a calorie-restricted diet. For people who may need to gain weight, some protein powders may not provide enough calories to keep your weight up. For your specific nutrient needs, visit your local Registered Dietitian. Directions: Blend all ingredients together in a food processor until smooth. Then pour dollops of pancake batter into a hot pan that has been lightly sprayed with cooking oil. Cook the pancakes on each side until golden brown. Remove from pan and top with fruit, syrup, or other toppings. Maybe you’re starting to think that protein powder is not essential in your diet, but you still want a high protein breakfast that’s quick and easy. Here’s a recipe for a yummy high-protein PB&J shake that does not require protein powder. Directions: Combine all ingredients in a blender. Add ice and blend if desired. Allergen Warning: This recipe contains milk, soy, and nuts. As you can see after reading this article, protein powders may be helpful for select populations like vegans, seniors, athletes, and those with a chronic disease that puts them at risk for muscle wasting. For the general public, no protein powder should get in the way of a well-rounded diet that contains adequate carbohydrates, fat, and protein. If you feel that your needs constitute some form of protein powder supplementation, use the guide and product reviews above to help leverage your search for the perfect protein powder for you. There are a lot of protein powders to try, but hopefully this list gives you a starting point to finding the best protein powder for your needs and your taste buds. So what is the best protein powder for you? Which is the best tasting protein powder in your opinion? Let us know in the comments below. The post Top 6 Best Protein Powders for your Diet appeared first on Livin3. Next story Selena Gomez: Drinking Heavily Following Kidney Transplant?